Automation & Security can provide all of your perimeter security system needs in Beal and throughout Northumberland. Whether it’s electric gates, barriers or bollards they can install new or upgrade existing security solutions. Electric Gates are a great way to not only manage traffic flow in and out of your property, but also as a great intruder deterrent. Automated systems can add an extra layer of protection as these can be linked to your existing employee database, meaning that only those with authorised access can enter your premises. This is a great solution for areas of your property that are separate from visitor access. 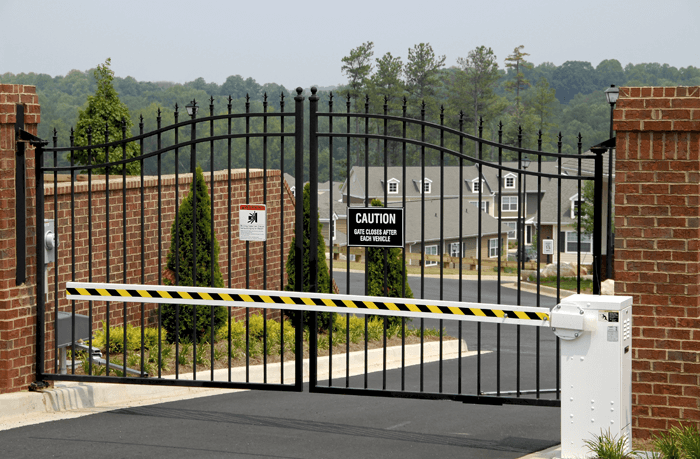 Automation & Security can provide a wide range of electric gates for different types of applications including cantilever gates, sliding gates and swing gates. The main advantage of arm barriers is that they provide a great way to manage traffic flow in and out of your property. These are usually seen in retail parks, shopping centres, golf clubs and hotels, where the flow of traffic is quite heavy. These can be either manual or automatic and after often operated by key fob or card. Bollards from Automation & Security, act as a deterrent from properties which are at a risk of ram raid and also as a way of separating pedestrian areas from roads. These can either be fixed or semi-automatic and activated once needed. The advantages of this is that when not in use, they are flush to the road surface, protecting the aesthetics of your property. Bollards also come in a wide range of colours and options including led lighting. With the increase risk of terrorism, a new range of security products have been launched with PAS68 standard security. These products are able to withstand impact from a vehicle even at high speeds making them a great solution for security sensitive areas such as airports, military premises and financial institutions.